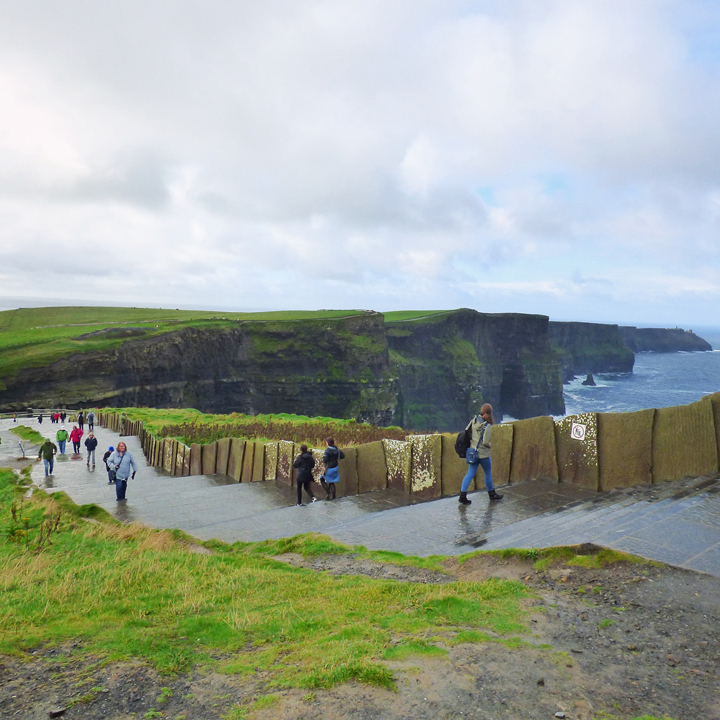 On our itinerary today was a visit to the breathtaking Cliffs of Moher, one of Ireland's great natural thrills. We raced against the weather to get to the Cliffs before the rains came down! We musta had a bit o' luck o' the Irish on our side for reasons two-fold: 1) we saw a rainbow! And 2) the torrential downpour only started as we were walking back to the car - we had amazing views the entire time! Chris let me out right at the entrance so I could run and take advantage of the lovely light while he and the kids parked the car. 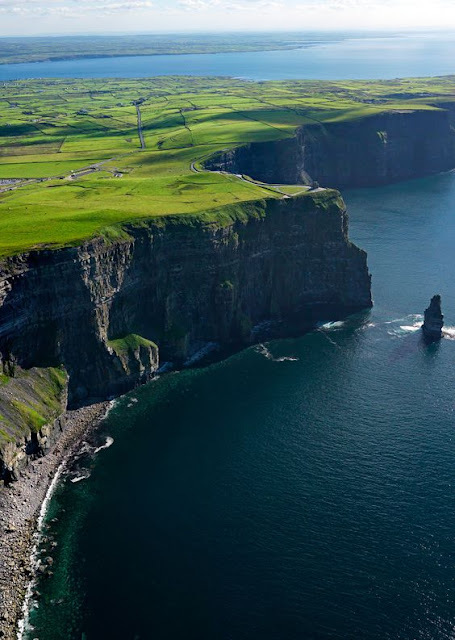 For five miles, the dramatic cliffs soar as high as 650 feet about the Atlantic. For years anyone could walk right up to the cliffs until numerous fatal accidents prompted the hiring of rangers to keep people from getting too close and the installation of this lovely area which is walled off from the edge. Our family at the Cliffs of Moher on Monday, September 21st 2015. Looking back inland from the cliffs. Purdy Ireland. These are where they filmed the Cliffs of Insanity in The Princess Bride and I also read they're in Harry Potter and the Half-Blood Prince! I just watched that entire series right before we went to Ireland, now I gotta watch it again and keep my eyes peeled for where they filmed here! 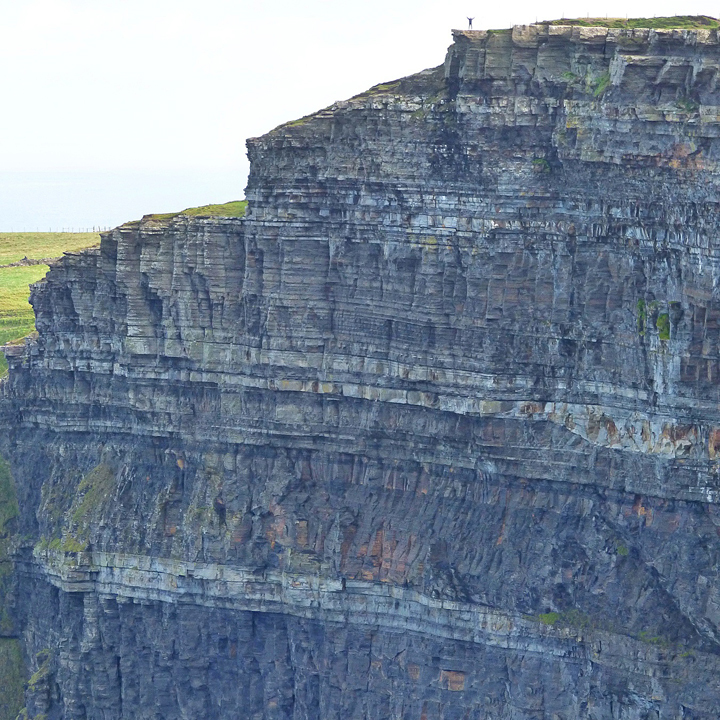 O'Brien's tower stands on the highest point of the cliffs and was built in 1835. Looking at O'Brien's tower from a distance. The "civilized" part of the cliffs with the paved walkways and nice wall only extends a couple of hundred yards in each direction from the visitor's center. After that, it is much like it used to be with dirt paths along the edge and nothing to keep you from falling. Chris decided to run out along the path a way so I could get a picture of him. I'm glad he didn't slip and plunge to his death. He claims there was a nice path a good ways back from the edge, but I still worry! See that tiiiiny speck on top of the cliffs on the right side of the photo? Same photo zoomed in. That's Chris! Epic. They have a little monument dedicated to those who have perished at the cliffs. Two things make this place particularly dangerous: the strong winds and the fact that at times large chunks of the cliffs will break off and crash into the waves below. Could this be any more scenic? We were so blessed with great weather while we were here. I'm so happy it was a nice clear day with no fog so we could truly appreciate the grandeur of the cliffs. When we were done enjoying the views we walked back to the visitor's center and got some lunch and a magnet and then ran back to the car through the rain that had rapidly descended on the site. We felt so bad for the tourists in the buses that we just pulling in as the rain started coming down. Getting close to wrapping up recap posts - second to last one: Galway, Ireland! Wow wow wow! What a magical and beautiful place!! The no railings reminds me of the Grand Canyon ... one wrong step and see ya! LOL!! Thank you for posting your lovely travel photos.....everything is so GREEN! Unlike California right now. That picture of Chris scares me! My favorite part of our trip! I am so glad the weather worked out for us.